Hey, Hey FIRST OFFICIAL DAY OF FALL! It's good to see you. ;) Now please invite the nice crisp fall weather to join you. Narci, Andrea, and I are sharing our Friday Favorites from the week. Like always we invite other bloggers to join us and then link up. It's great way to find new blogs to read and for others to find you. I highlighted some of my FAVORITE FALL FINDS on Tuesday. And be sure you've entered the GIVEAWAY! 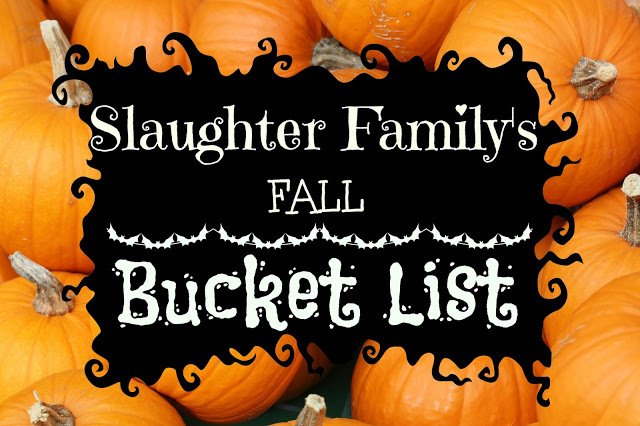 Wednesday, I shared what's on our family's bucket list this fall season. This was a little over a week ago, but did you hear the good news? We had Britt's check-up from her palate repair and the doctor said it looked great. He released her to eat ANYTHING and we got rid of her arm restraints. Again, thank you for all the prayers. It was a tough surgery and recovery time, but I'm so glad it's behind us. I got a lot of questions about what her arm restraints looked like. I didn't take many pictures, but I do have this one where I happen to be making that awkward mid-blink face (so I covered my face right up). They were soft, velcro pieces with a strap that connected them on her back. I was envisioning much much worse when the doctor first mentioned arm restraints BUT they were still annoying when you're used to rolling around while you sleep. Do you guys follow House of Belonging on Instagram? If you don't, you should! This swaddle/wall hanging is everything. Isn't it? On Saturday morning, this is us pre-face washes and one of us has her chocolate PediaSure spill all over her pajamas BUT this was our reaction to a gecko that got squashed in our door. Yes, squashed. What are the odds when we closed the door Friday night a gecko would be halfway through and get squished? My first thought was-we'll have to skip Nixon's game because there's no way we're gonna make it to the car. (The gecko was stuck in the door to the garage.) Neighbors saved the day and removed it for us. Saturday evening we went to the Mesquite Rodeo. I've heard about this rodeo numerous times and just never really thought about taking the kids. We had zero plans on Saturday evening so I decided it'd be fun to check out. I'm SO glad we did. The arena was so nice and clean, had air conditioning, and the rodeo was definitely entertaining. We had space for Britt to walk around which was so nice. Ebby Lee's reaction to the bucking broncos was priceless. Mackenzie (holding Britt) began watching baby Ebby Lee for us years ago. She's watched our kids grow up and has graduated both high school and college. She's now back with a "real job" living pretty close so I invited her to join us for the evening. We absolutely love this girl! Bowen got into the whole cowboy thing rather quickly. There was a nice guy who'd bring his horse over for the kids to pet every so often. We stayed for the end because BULL RIDING, got home way too late, and woke up to Bowen asking when we could go back to the rodeo. Definitely a successful night! Oh the gecko!!! 🙈 Loved those rodeo pics! Bowen is such a cute little cowboy! Ummm, I would've had a heart attack over the gecko!!! I didn't even know we had those here?? That IG post from House of Belonging brought me to tears last week...SO beautiful!! Happy Fall! Yay for Fall!! I'm breaking out my decorations today... so excited!!! Hallelujah for getting rid of her little arm braces. 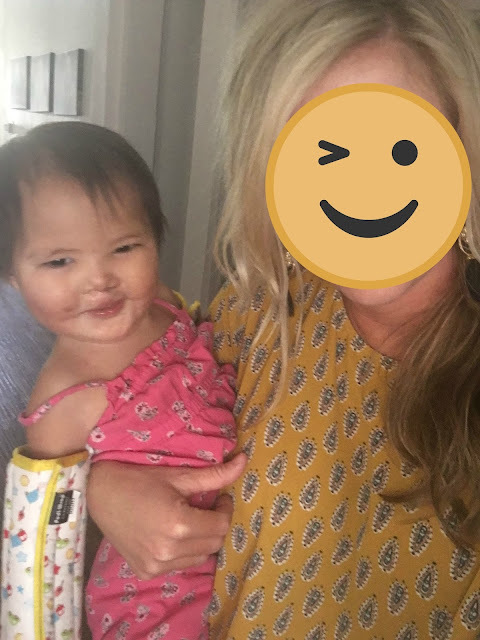 I lived through that with one of my sweetest friends 20 years ago when her little boy had several surgeries for a severe cleft lip and palette. I always thought of those braces as being the human equivalent to the "cone of shame" for dogs...LOL. YAY BRITT!!! Eat all the things little girlie!! !❤️ Have a great weekend! We could have a pool party here in Minnesota too, nothing says fall like 97 degrees?! What?! I love the color of that shirt! Those are the cutest little cowboys and girls! Have a great weekend!